I'm almost ready to leave for St. Louis. It's only a 4 hour trip. But I will have to make a stop or two. (Antique shops along the way!) I always need more dishes. Before leaving I want to let you know a couple of things. 1. We have a new quilt pattern coming out. The title is Wild Pomegranate. It will be similar in format to Hallowe'en - 1904. Here's a glimpse. This set-up was really fun to do. Barb spotted these hydrangeas at a local gas station. She dropped by and asked if she could take a couple of blooms. A young woman working the cash register told Barb she thought it would be fine. Makes me want to go to the nursery and purchase a couple of shrubs. These blooms are lush! Thank you for checking this site. When Quilt Market is over I promise to be a better blogger. P.S. Taking my camera.....will get some photos of market for you too if Barb lets me out of the booth. AND Faustina # 167 send your address to alma@blackbird-designs.com for your prize...I haven't heard from you yet. ooooo! i get to be the first to post. sure hope that's good luck. have adored all of your patterns from the start and i mean all of them. have a great market. I just love your designs!! Keep up the lovely work. Can't wait to see market pictures. OH, can't wait to see all the new patterns! ENJOY Market, wish I were going to be there, but alas, not this time. Maybe I'll see you in Nashville in Feb! How kind of you to offer your new patterns! I would love the chance to receive them. Have a great time at Market! Have fun at Market and drive safely. You first had me with the name 'Pomegranete' . . . & then the hydrangeas! (my favorite!) (Good eye Barb!) We are too warm here to plant them . . . so I think I love them even more! Hope you have a wonderful Market! I've stitched up so many of your designs -- I need the new ones, so pick me please! Oh my, I so hope I win this drawing! I am currently stitching my way through the year of stockings and having a great time. Thanks for all the wonderful patterns and inspiration. Would love a chance to win! Can't wait to see your new releases! Thank you! How wonderful! Hope you enjoy the days at market. Best wishes for market, and the antiquing along the way. Sounds like a fun road trip. 4 hours, just perfect. I love your designs, I have several stitched. Please enter me in your giveaway. OMGosh what a great giveaway!!! Have fun at Market. What a beautifull name (pomagranetes) for a pattern !! Enjoy the market. Thanks for the giveaway... count me in please. Just love the new quilt pattern. Can't wait to get my hands on that. Would love to get the new cross stitch patterns. You have such beautiful patterns. Have a great time at Market, Alma and Barb! Looking forward to seeing your new releases. I love your designs and would love to win some new ones! Please enter my name. Thanks for such generosity. If you don't mind french contestants.... I'm in!!!!!! Sign me up for the drawing please. Please enter me! How fun draws are!! Can't wait to see all the new stuff. The halloween stockings are working up so fast and are so cute. I love hydrangeas, we have them in our garden. Have fun at Market (and on the way antiqueing!). Please include me in your contest. How exciting!!! I love contests especially if they have to do with stitching!!! Fingers are crossed my name will be drawn. Can't wait for the new releases...I just love pomagranetes...and even better a giveaway !!! Oh MAN, I REALLY WANNA WIN!! LOVE your designs! Hope you have a safe trip and find lots of dishes! LOL Thanks for ANOTHER great giveaway. Please count me in your draw! Have a great time at Market - look forward to seeing the photos! Love the new quilt!! Such a cute picture! Have fun at market! The new quilt looks absolutely gorgeous, I hope it's ok to enter from the UK. Can't wait to see the pattern and love the set up in the picture. Cute idea with the clothes line. Pretty picture. I'd love a chance, please enter me. love,love,love the new quilt pattern. Hydrangeas have always been a favorite of mine-we call them "snowballs" where I come from. I have a pomegranete rug to hook...can't wait to see your quilt pattern. O what a lovely pillow! I am using the same fabric right now for a BOm I am working on. And I even used the blue version as a border around my latest finished quilt! And also used the rickrackband in the binding. took me a while to figure that out, but it looks soooo great. What a contest. I can't believe I'm the 48th entry. Aren't there 1000 yet? I would love to win - please enter me in your very generous drawing!! Have a great time at Market!!! Can't wait to see what you come home with - photos and antiques. I'm in love with the Pomegranate quilt. I've been having a hard time finding the pattern for the Halloween quilt though...I'll have to keep looking! I am very excited by the new release and I would like so much that it is Time to buy them or ...win them. Thank you to share your designers adventures with us. I am very proud you choose an old french sampler for your new book. As you can read my poor english I am French. Would love to receive your new patterns. Can't wait to see the rest of "Pomegranate"
Your work is inspiring! I just can't finish one of your projects before you come out with a new one that I want to do. Please keep up the great work! Have a safe trip! Your new pattern looks wonderful. Your new patterns - how very exciting -Oh, definitely enter me in your drawing - I just love your new Christmas book (and I have only seen the cover). Can't wait to see what other goodies you have in store for us. My dad used to say that when I was a child and it's funny to see it here again. My english is not very good and I cannot find it in my dictionary. have a wonderful time at Market! How fun that must be!!! Would love to attend some time!!! Guess I need to open a shop first!!!! Me encantannnn, espero tener suerte. I love the flowers and quilt. Hope you have a nice trip. Ooo! I would LOVE to be entered in your drawing :o) Good luck at Market! O, I would love to win a book of you! I'm making your trick-or treat baskets at the moment and I love them, like I love all your books. When I buy a new book, I like all the patterns, which I don't have with books from other designers. 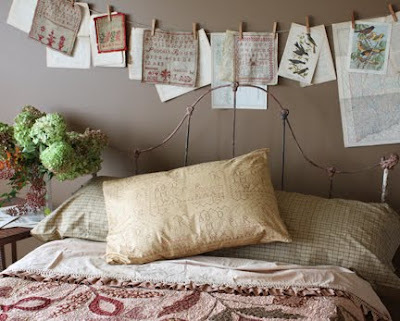 And your crosstitch patterns are made to hang above those gorgeous quilts. Please enter me -- thank you! Hope the market goes well. I love all your patterns even though they are more difficult to come by here in the UK. Please enter me in the draw. Ohhh! How exciting. Have a great time at market. Oh, please enter me in your wonderful giveaway. thanks & have a great trip. Can't wait to see all your new stuff! I love those hydrangeas blooms, and the whole photo is just so beautiful! I'm excited about your new releases! I am a Blackbird "junkie" and I can't wait to see your new market items! I would love to be in your drawing! Thanks for the chance!! Me, me, pick me! I love your designs. Please pick me!!!! Please enter me in your give-away. Enjoy the market. Please let me be lucky for once! Thank you for letting us have some fun at your generosity! Thank you for the game ! I love your new pattern ! Oh I wish I was a quilter because pomegranates are one of my very favorite things! Maybe there is a pomegranate cross stitch pattern in the future? Please enter my name in your contest drawing! After while crocodile! Oh I love pomegrante blocks, check my blog today! Can't wait to see the whole quilt! Please enter me in your contest! We are lucky enough to have a lot of hydrangeas growing on our property. I love the way they change color as the season moves along. Can't wait to see your new quilt pattern. The sneak peak was such a tease! What a beautiful photo! Another great talent of yours. Please enter me in this generous giveaway. I'll keep my fingers crossed. I would love to win the cross stitch patterns. I would love to enter your contest. Hope you have a great time at market. I am loving this years loose feathers club. Would love to win the new designs! I would be thrilled to win this price! oh oh I can't wait to see all your new designs that you release this weekend. I love all your pieces and I think I have alot of them. :) Hope I have good luck when you are home and pick a winner. Wow, you girls do some wonderful work - and your Blog is great. It is the first I go to each morning. Count me in! I'd love to have copies of your new pieces. Love the quilt. I wish I was in the car with you stopping at antique shops and THEN market - with all the new and wonderful designs. Temptations galore. Have a safe and wonderful time. I would love to enter your draw!!! Hi Alma, Have fun and don't forget to get photos of what you buy at the antique stores too. Have a great trip...looking forward to the new patterns! I would love love love to win the new charts! Love the new quilt too! You girls are the best! Oh, I love your setup for this photo shoot! I'd love to be included in your drawing. Don't eat too much convention center food--it will just "sit" in the bottom of your tummy for the whole day--and you'll know this, but you'll be in line again the next day. Yes, this is "eating out," but no, really nice restaurants don't typically serve your cola in a red and white paper cup. Safe travels, and have fun! oh, i REALLY hope i win! i LOVE everything you've shown - and your pictures are always gorgeous! I am currently working on Willow House AND Summer Jubilee. ;) And I just finished Evergreen. I'll need a new project soon.....! And my birthday is in October. :) Hope you pick me! I would be blissfully happy if I could fill my house with your cross stitch and quilt designs. That picture is wonderful and makes me wish I had that room! Really lovely. I would love to win a prize draw. Your designs are amongst my favourites. Look forward to the market photo's Michelle P.
oooooo! Pomegranetes! Soooo Beautiful! Please enter me in your drawing! Have a great time at market! I hope Barb lets you take tons of pictures -- I'd love to see more of market. I love what I can see of your new quilt pattern too. :D Thanks for the lovely giveaway! You and Barb are the greatest! Smiles all the way from Poland! Have a wonderful time at market! Looking forward to seeing some pics. Would appreciate a chance to win your patterns. Good luck everyone! ohhhh such a tease!!! I love hydrangeas too and bought some bushes that bloom all summer long! Love your new cross stitch book cover and I from what I see, this quilt looks yummy! YAY for Blackbird contests! Love you guys...have fun at market! I can't wait to see the Christmas book! I've already bugged my LNS to order it! Wahoo!!!! And please enter my name too! Thank you, your gift opportunities, they are always great. Looking forward to your pictures. Have fun. Would love a chance to win one of the designs. Love the Halloween stockings. I have one stitched and finished. Too cute. Should finish another this evening. Please add me to the giveaway drawing...my fingers are crossed and hoping to be drawn! Good luck to all who enter this generous giveaway...Thank you! The Halloween pattern is wonderful! I can't wait to see this new pomegranate pattern! Ohhh....please pick me! 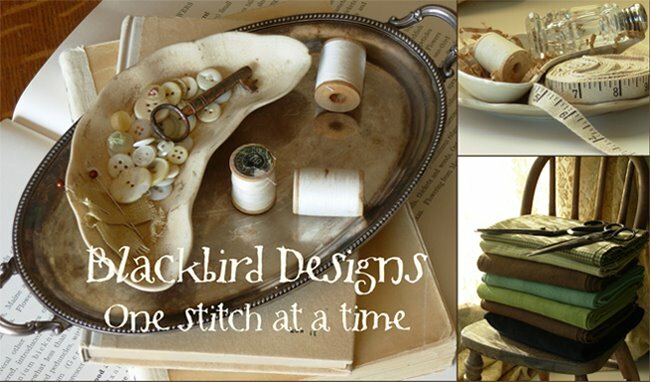 I LOVE Blackbird Designs and all of your cross stitch. Love the blog and looking forward to your new releases! Wow, there are already 124 comments. I'm sure I don't have a chance, but would be thrilled to win. Please enter me in the giveaway and thank you for your generousity! I would think I'd died and gone to Heaven if I were to win this sweet contest! Thanks for entering me. It must be very busy, thanks for blogging. I wish I had enough time to make all the quilts I admire from your many books. As it is I have made four and am working on two more. Your designs always strike a cord with me. From what I can see in the new quilt, it is going to be a beautiful pattern. Have a safe and fun trip and can't wait to see the pictures. Oh, I love that quilt! But then I love all the quilts that Blackbird designs-all my favorite patterns. And you have such a knack for lay-outs and nifty accesories. Such a pretty photo set up. I would love to be entered in your drawing. The new quilt sounds very promising. Lovely colors. I can't wait to see the WHOLE quilt!! Thanks for the give away-love your blog! What a tease!!!!!! Am anxious to see the rest of the quilt!!! Have a great trip! Can't wait to see the new designs. Lucky you, wish I had my car packed to go also. Hope all goes great for you at the market. Have a wonderful time both getting to Market and being there. Keep up the wonderful designing work! I love your things. Thank you for your generous drawing! Your patterns are wonderful! Oh...I hope I am lucky! I can't wait to get my hands on your new Christmas book..
Have a safe trip -- and please do share the names, locations of your favorite antique shops between KC and St. Charles as that is a trip I frequently make. Can't wait to see all your new goodies from the Market - and I hope Barb lets you out of the booth to take some pictures for us. Please include me in your drawing. I finished stitching my first Halloween stocking last night, and bought some fabric on my way home from work. Hopefully, I will be successful in finishing it. Love, love, love your designs and your blog is great! Oh...I hope I am lucky...I love your new Christmas book. Please include me in your give away. Would love to win! I'm still picking out colors for Halloween 1904. Very interested in the One book and three patterns you talk about!! LOVE your stuff. You ladies are amazing. Have fun at market! Oh I love your designs!!! Please enter me in your contest. Thanks for the chance. As usual: FANTASTIC! I would love the win!!!!! I know I'm going to love the new quilt and I just adore the 'flags' of stitching. Safe travels to the show! I love the picture of your new quilt. I always check your blog to find out what you two are working on. Keep all those wonderful ideas coming. Can't wait to see your new designs! The sneak peek of the quilt looks great. I hope that you both enjoy yourselves at market! Oh boy! If my name is picked I will jump for joy!!!!!!! i'm looking forward to all the market pictures! Ooooh! What a tease - can't wait to see more of that gorgeous quilt! I hope I win! Have a great time in St. Louis, Louis. I hope you meet everyone at the fair! I love your designs and would love to win your giveaway. You ladies are very generous! I just love the sampler on the front of your new book, and I'm sure the other designs you're releasing are just as wonderful. Please pick me! I hope your market trip is safe and fun! I would love to have your new designs! Have a safe trip to the Market - I'm sure everyone will have a fantastic time. Love your blog and designs! Hoping I win!!!!! I LOVE this photo! My eye was first drawn to all the samplers hanging above the bed(be still, my heart), but I also noticed those beautiful hydrangeas. Just the right touch! Would love to FINALLY win some sort of blog giveaway! I'd love to see more... so please count me in! I would love to win new patterns!!! Please add my name to the list!! I would love to be entered into the contest. The samplers over the bed are calling to me. LOVE LOVE your patterns. Can hardly wait to see what comes out at Fall Market. Love all of your cross stitch patterns. Hope I'm lucky. Pick me! I love to stitch! I'd love to win. your designs are so cool! love your blog, love your patterns, love to do needlework so I would love the prize!!!!!!! love your blog, love your patterns, love needlework, would love the prize!!!!! Have fun at Market! Can't wait to see your new patterns, especially the new quilt pattern! Have fun at market! I can't wait to see your new patterns, especially the new quilt! Looking forward to the pomegranate pattern...I'd love to jump right into that picture and check out that new quilt! Thanks for the great giveaway! Keeping my fingers crossed. I'm a "newbie" to your blog and I look forward each day to see if you have posted anything or not. Thank you for the contest. I adore your designs. Surely a labour of love. I would love to win your prize. Your patterns are so much fun. Wow, there are a lot of comments/entries here! Still, I would like to add my name to your contest. Thanks so much. Keep up the beautiful work! beautiful setup! Wish I was going to be in St. Louis (St. Charles actually- I LOVE historic St. Charles!) Please add me to your awesome giveaway! Thanks!